From left sitting: Kailey Filben and Andrew Rice. From left standing: Taylor Sessums, Dharma Cox, JoJo Brosky, Larissa Magers and Creed Kidney. The John Marshall High School Music Department is pleased to invite the public to celebrate the holiday season at a combined Christmas concert. “Monarch Tidings” takes place on Thursday, December 13, 2018 at 6:00 pm in the JM Center for Performing Arts. 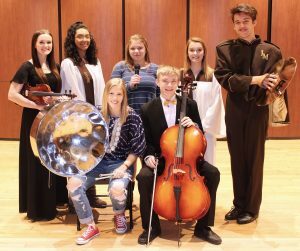 This student produced, one night only event will feature selections from a combination of ensembles including Concert Band, Steel Band, Concert Choir, Monarch Choir, Chamber Orchestra, String Orchestra and Symphony Orchestra. WJMH Media students JoJo Brosky and Logan Riggenbach will host the show. Festive tunes such as Christmas Vacation and Skating along with well-known favorites Happy Xmas (War is Over), Irving Berlin’s Christmas, The Christmas Waltz and My Favorite Things will deck the halls of the CPA with Christmas cheer. WJMH Media will record the entire concert. The production will be shown in its entirety on WLUTV, West Liberty University’s TV station on Comcast Xfinity channel 14, around Christmastime.